This is an example of a Method Statement for bricklaying. To Complete Bricklaying work to the required line, level and elevations as per Architect & Design Drawings. 1. Use of Mechanical means where possible. 2. Use and continual use of PPE. 3. Good house keeping practices. 4. Continual inspection of plant and tools. 1. All drawings will be studied and understood before works commence. 3. Materials will be stacked as close as possible to the working area. 4. Brick and block work, wall ties, damp proof membranes, cavity details will be in accordance with Architectural and/or engineers drawings. 5. Bricks, Blocks and Mortar will be supplied to the Bricklayers by experienced workers (hod carriers) the materials will be positioned in a manner to reduce the manual handling requirements. 6. Mortar will be used in accordance with the design specification. 7. Mortar will be mixed on site and measured to ensure consistency. 8. Trestles and boards will be used where required for as short a term as possible, these will be checked before, during and after use. 10. Line and level will be continually checked during works. 11. All surplus/broken materials will be removed from the working areas to ensure continual housekeeping as part of our safe systems of work. The Supervisor will have a mobile phone available to summon assistance. 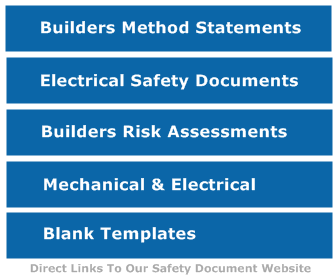 NEW- We have released a full Brick and Blocklaying Pack of Method statement, Risk Assessments and COSHH Assessments available HERE now.